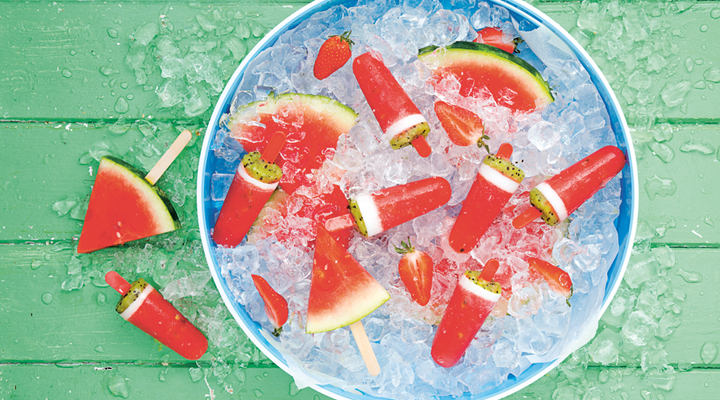 These watermelon fruit pops are a refreshing, healthy alternative to your normal ice pops and are guaranteed to be enjoyed by all! Put the watermelon and strawberries in a mini blender and blitz until smooth. Pour into a jug and stir in the passion fruit flesh and seeds. Divide between 10 x 75ml ice pop moulds to come about two-thirds of the way up the moulds. Place the pop sticks into the centre. Freeze for 2 to 3 hours, until set on top. Divide the coconut milk evenly between the pops. This should be about 1½ teaspoons for each one. Return to the freezer for 1 hour or so, until set. Peel the kiwi, chop the flesh and blend it in a mini blender until it’s as smooth as possible. Divide the purée evenly over the pops, spreading it smooth. The pop moulds should now be filled to the top. Return to the freezer for at least 1 hour, until completely set. Run the pop moulds under warm water for a few seconds to help loosen and release the pops and get slurping!